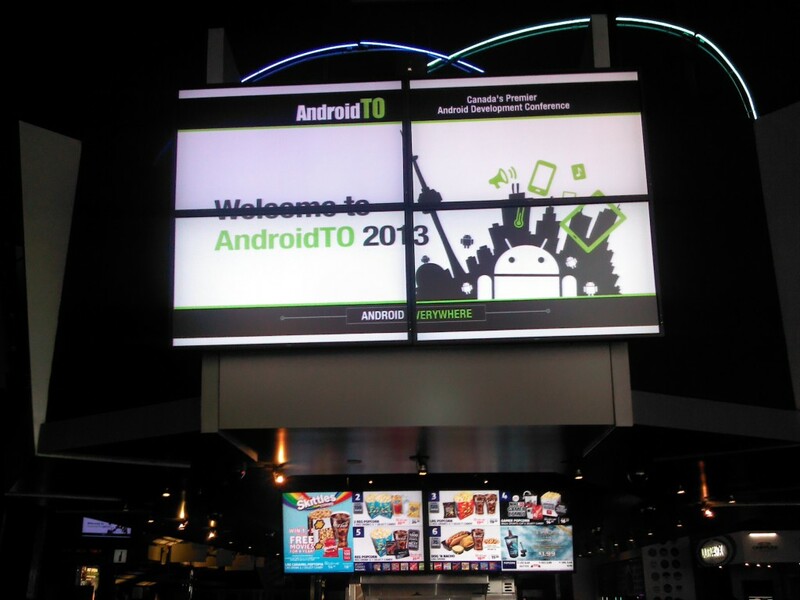 On October 17th, 2013, hundreds of individuals who are involved in working with Android arrived at the Scotiabank Theatre in Toronto to attend AndroidTO 2013. Attendees of this conference were there to gain knowledge on topics such as Android software development, Android UX design, and mobile business. As one of the individuals who attended this conference, I would like to post about why I considered the experience of being at this conference a highly valuable one. If you read what I posted on Twitter during the conference, you will know that I found that the knowledge passed on during this conference was quite valuable. And I would like to elaborate further on why I considered it well worth it to attend this conference. Throughout most of the conference, talks were held in four separate places. In each of these places, a certain topic was covered. There were sections, or tracks, for development-related talks, design-related talks, talks on mobile business, and gaming-related talks. As I am an Android developer, I attended the development sessions. And hearing from individuals who are highly experienced with Android development helped make attending this conference worth the price of admission. 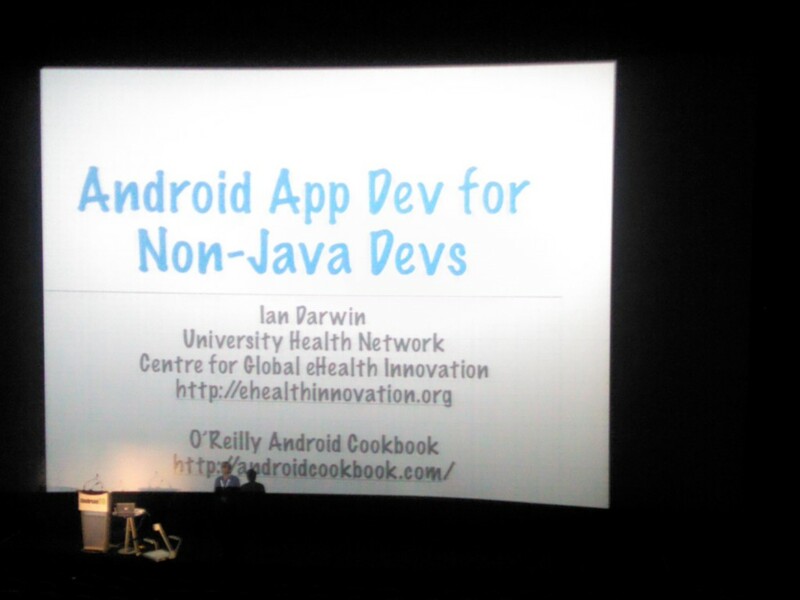 The first of the development talks was held by Ian Darwin, who has written books on Java and Android development. He talked about developing Android applications with programming languages other than Java. I recall him mentioning that it was somewhat ironic that he has written books on Java, and that he was talking about using languages other than Java to write Android apps. Nevertheless, it was interesting to hear him mention advantages of not programming in Java when writing Android apps. He did mention that the MIT App Inventor is useful for non-developers. And when he gave code examples in languages such as Python, he noted that the code was shorter and more simple, and was therefore less likely to contain bugs. However, he did mention disadvantages of writing Android apps this way. For example, he mentioned that the library for writing scripts that will run on Android, called SL4A, is still alpha quality software. The second development talk was held by Orrie Shannon, who is the leader of the Android team at Wattpad. In his talk, he gave useful and valuable information on how software testing is done at Wattpad, and how analytics are useful to them. He also mentioned a strategy used at Wattpad that may be considered amusing but highly effective. He said that at Wattpad, they have their Android and iOS teams compete with one another in testing software. Naturally, there is a rivalry between these two teams, and they would both dislike losing when competing with one another. In addition, members the losing team become the “servants” to members of the winning team. I find it difficult to imagine a more effective way to motivate these teams to do as well as they can. The third development talk was held by Matthew Patience and Greg Carron of BNOTIONS. Their talk was about the use of various tools in testing software and tracking feedback. They mentioned how they use these tools, and how these tools make app development and testing more efficient. While some of these tools did certainly appear to be useful, some of them, such as Pivotal Tracker, AppThwack and HockeyApp, are available for a fee. However, considering how useful these tools are, these fees may well be fees worth paying. They also gave out a Chromecast to the first person to correctly answer what I thought was a simple question about Java. Any experienced Java developer should be able to name three common exceptions in Java. In the fourth and final development talk, Shidan Gouran, who is the CEO of HomeJinni Inc., made interesting points on what he sees in Android in 2016. He mentioned that as devices become more energy-efficient, they will always be on. And he said that because Android devices will always be on, they will become context-aware, learning more about their users after seeing and hearing what their users do. Targeted ads could then be displayed to users of these devices. He also did, quite understandably, say that he did not see NFC taking off, and he believed that iBeacon would be a success. I found it interesting to hear what he said about how cameras will change. However, you may find that ironic because none of the pictures that I took during his talk turned out well, which is why there is not a picture from his talk here in this post. Although the development-related talks were interesting and informative, I thought that the closing keynote was the highlight of the day. 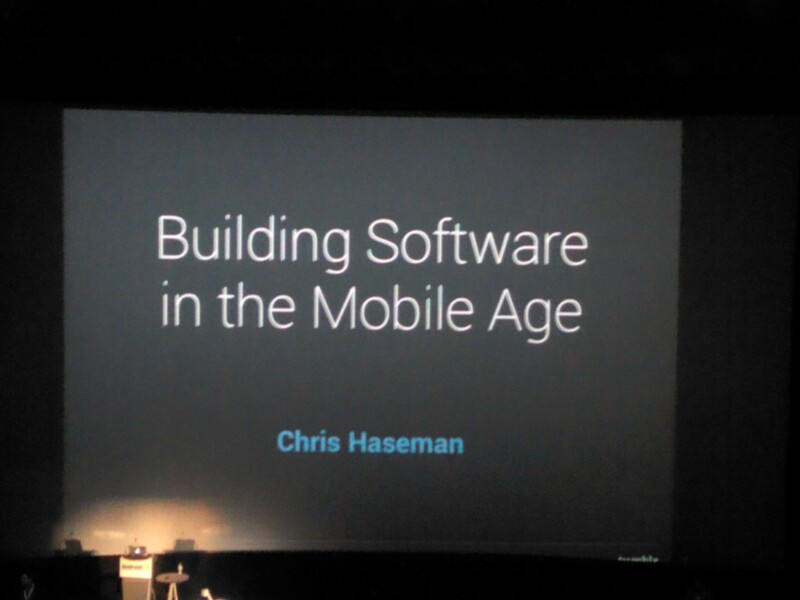 This keynote was given by Chris Haseman, who has the title of “Mobile Engineering Manager” at Tumblr. He has several years of experience in developing software, and is now a “pointy-haired boss” as he calls himself. His ability to see development of software through the perspectives of both managers and developers has helped him understand how managers and developers can work well together. He also made very good points on Android development and on interacting with users. Shortly after his closing keynote, I mentioned on Twitter that he made “one great point after another.” And based on what I read on Twitter during and after his keynote, it seemed that many other members of the audience thought so as well. He gave several insights that were short and pithy, and were repeated on Twitter not long after he gave them. He also made these points in a very entertaining fashion, eliciting laughter several times. 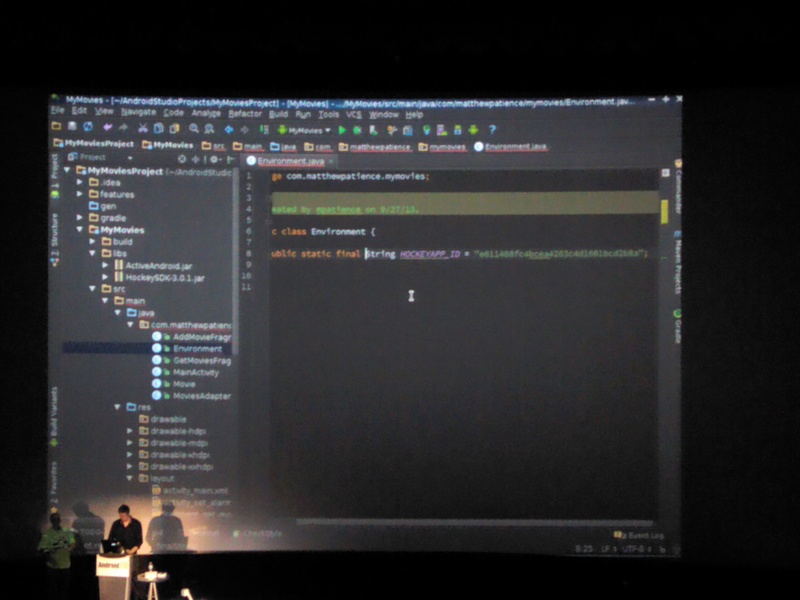 And when some said that they were inspired to write great software for Android after the conference, I’m sure that Mr. Haseman helped give them that inspiration. Throughout the conference, I listened as individuals who are highly experienced and successful in Android development passed on the knowledge that they have. The knowledge that was passed on at the conference made it well worth attending. And I found the conference to be inspiring as well. It made me more inspired to try to make the next app that we release to be as good as possible. I am unsure when exactly that next app will be released, and Chris Haseman said that developers often underestimate how long development will take anyway. However, I am sure that I am a better Android developer than I was before I attended the conference. And I would recommend attending the AndroidTO conference to anyone involved in Android development. 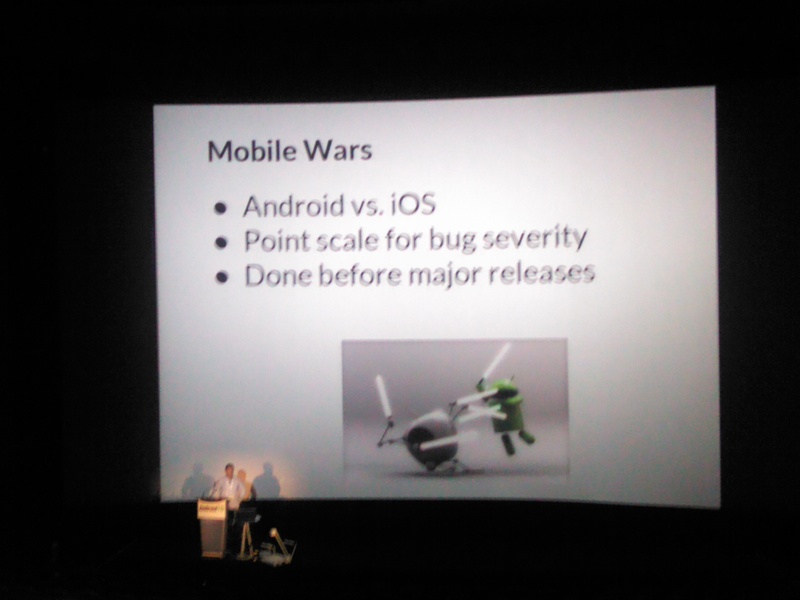 In fact, I am already looking forward to AndroidTO 2014. Posted in Android, Android Apps, AndroidTO. © 2019 Subarctic Systems. All rights reserved.